Some while ago I purchased a EZP2013 device programmer on eBay. There were literally scores of sellers, and they all looked the same, and some variation in price from about US$25 to US$50… which is not unusual. I used the thing a few times, and it was clearly a very poor product so I replaced it with a SOFI SP-8B which cost close to US$50 on Aliexpress including a bunch of (6) adapters. In a trial on a Microchip 24LC256, the SP-8B is nearly four times as fast, confirming my gut feel that the EZP2013 wasn’t good value. Further, the SP-8B (which isn’t the cheapest of SOFI’s product) has much better features and more polished software. It turns out following the trial that the EZP2013 software informed me that the device was not genuine and has been bricked so it cannot be used anymore. No big loss, it was not very good and I had replaced it… but it is a salutary warning of the risk of buying any EZP2013 or any other product from Chinese maker CORIGHT. CORIGHT are SOWRONG, they have shown that they have released products that have been readily cloned, and their solution is to wound the victim… a strategy that FTDI found did not further their marketing. 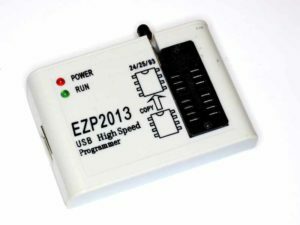 The safe approach, avoid EZP2010, EZP2013 or any product by CORIGHT. Do not depend on eBay seller protection, I have discovered it is not effective against Chinese counterfeiters.